Hello and welcome. A little fun today using the new Daughter verse by Visible Image which is just lovely. I don't normally do girlie cards but I felt these all went together so well. 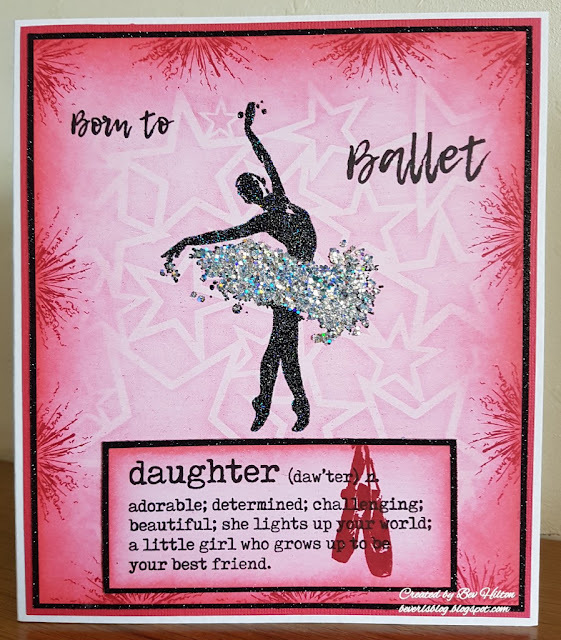 I don't have a daughter myself but I'm sure this would be a perfect card for many daughters out there and also any age. Clarity Stamp 250gsm smooth white card. Visible Image stamp set...Born to Perform. Leonie Pujol stamp set...Lots of Texture LP-ST-LTEX. Crafters Worklshop Stencil...Mini Star Shower. Stampin Up Ink Pad...Rose Red. Stampendous Frantage...Silver Halo Mix Glitter. I began with a piece of smooth white card and lightly blended over with worn lipstick. Place the stencil over the card and brush over with the rose red. Stamp the element from the Lots of Texture set that looks like a firework, around the edge of the card with the rose red. Once happy blend around the edge using the same ink to darken. Take a spare piece of smooth white card and blend over as before, with worn lipstick. Blend around this with the rose red. Place this card onto the stamp platform and stamp the ballet shoes to the right. Leaving the card in place, stamp the verse with black versafine. I found I needed three ink ups for this but I think my ink pad is worn out. That's the beauty of the stamping platform. Mount this onto black glitter card and place onto the main card to work out where the ballerina is to be stamped. Using the black brilliance ink, stamp the ballerina a couple of times and apply the disco embossing powder. Heat until melted. Using the black versafine, stamp the wording. Now glue the mounted daughter verse onto the card. Apply the cosmic shimmer glue to the skirt and cover with the silver halo mix glitter. This really does look amazing but sadly doesn't show in the picture. Mount the finished card to black glitter card. Now mount to some matching rose colour card before mounting onto the white card base. A fairly quick and easy card to make and very pretty I think.